This is a stunning and exquisitely made horizontal Art Nouveau Period French poster for Georges Richard cycles and automobiles, by Charles Tichon in the 1890s. This is a rare poster that features a bold image and a simple color palette. 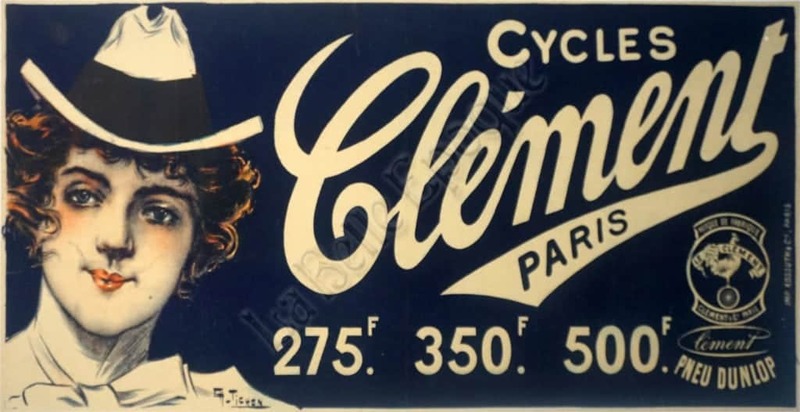 Navy blue composes the entire background, beautiful white typography pops from the background on the right hand side of the poster reading: “Cycles Clement, 275F, 250F, 500 Fr,.” The face of a beautiful rosy cheeked woman, with hints of red in her hair, wearing a dapper hat, is seen on the left side of the image. This lithograph was printed by imp. Kossuth & Cie, Paris, 1890s.